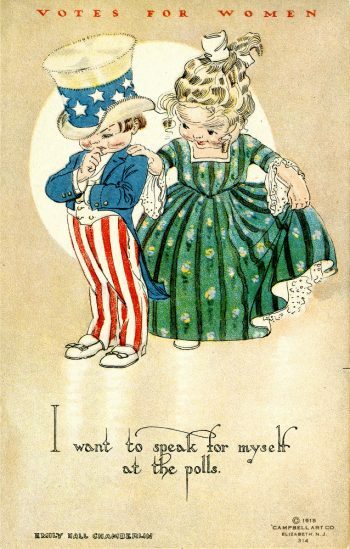 An anti-suffrage postcard. Image courtesy of the Catherine H. Palczewski Postcard Archive, University of Northern Iowa. The early rap on men who found themselves married to hard-working, hard-core suffragists must have been downright humiliating. Cartoonists portrayed them as gents in tie-and-starched-collared misery, shirtsleeves up, infants in tow, forced to scrub clothes at a washtub or toe-rock a cradle while they flattened dough with a rolling pin. That changed completely in the 1910s, as American men who had been roped to the votes-for-women movement by wedlock reinvented themselves with dashing post-chivalrous aplomb. Gone were the hen-pecked, emasculated drudges of the posters and postcards, replaced in the popular imagination by the real-life prominent, influential members of the Men’s League for Woman Suffrage. First formed in 1909 with chapters in Chicago and New York City, the League grew exponentially during the suffrage movement’s decisive last decade. It became a potent all-male movement auxiliary, with a membership in the thousands, across 35 states. Acting in tandem with the main women’s suffrage organizations, men in the League marched, spoke, wrote, published, gave money, led meetings, engaged in legal wrangles, hosted banquets, kept tallies on election nights, and worked the legislatures and the streets. They transformed the pejorative “suffrage husband” into a title of distinction. In 1917, Sarah Addington, a reporter for the New-York Tribune, described how women in the audience at an important suffrage meeting in Saratoga Springs, N.Y., swooned over the financier James Lees Laidlaw, the Men’s League’s national president. They envied his wife, the New York suffrage leader Harriet Burton Laidlaw, as “the luckiest woman in the world.” Not only did her husband lead the League and help support the movement financially, but he rode horseback at the front of the men’s delegations in the suffrage parades, accompanied his wife on state and cross-country campaign road trips, and staged events with her across Long Island from their summer residence in Sands Point. 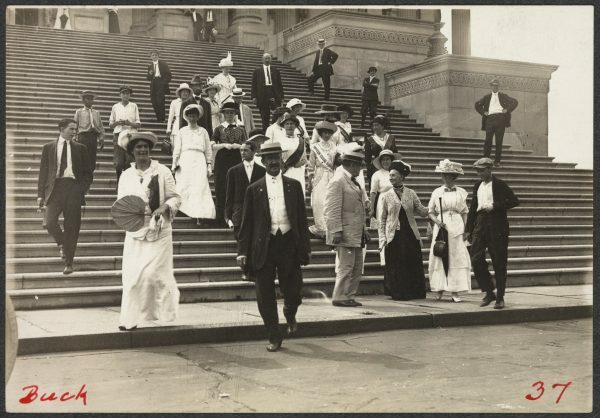 Harriet and James Lees Laidlaw, in foreground, on the Capitol steps with other suffragists on July 13, 1914. Photo courtesy of Library of Congress. There had been models of new-age suffrage husbands before the League took form, such as the highly supportive Iowans who married Carrie Chapman Catt, twice the president of the National American Woman Suffrage Association. The newspaper editor Leo Chapman, her husband from 1885 until his death from typhoid fever a year later, had worked alongside her in support of the movement. And her second husband, the engineer George Catt, was an evident source of financial and moral support. They were married from 1890 until his death in 1905. But there was a difference between Catt’s obliging spouses and the leaders of the Men’s League. The latter had power, influence, and national prominence—status they had achieved as businessmen, financiers, attorneys, jurists, politicians, academics, scientists, writers, editors, and publishers. They emanated a new kind of authority as widely admired men who were secure enough in their masculinity to be left unfazed by a vicious onslaught of taunts, brickbats, and “sissy” catcalls for their support of this widely disparaged nonstarter of a “women’s” cause. They actually got such abuse in 1911, the first time League members marched as a brigade in a suffrage parade along Fifth Avenue; but not the next. These men appeared to have had no problem with their wives casting off many of the duties that early 20th-century culture had ascribed to them. Of course, given their social status, disengagement was more likely to be from, say, club or charity boards than from the kind of boards deployed for washing clothes or baking pies. When the New York League of Women Voters struck a bronze plaque to honor the state’s greatest suffragists, nearly one-fifth of the 83 names it listed also appear in the New York Social Register of 1917, the year the state gave women the vote. Ratification of the 19th Amendment to the U.S. Constitution came three years later, in 1920, extending the franchise to all U.S. female citizens of voting age. The names of both Laidlaws appear on the plaque, James Lees Laidlaw being the only man to rate such hallowed recognition. “How long and burdensome is this effort on the part of non-voters, everyone knows,” he wrote in the Men’s League’s mission statement, explaining why it was critical for “a well-organized minority of men voters” to step up and help push the suffrage legislation through. Men were the vast majority of voters. Men controlled all the legislatures. And, he implied—as if to echo one of the campaign’s most sought-after orators, Max Eastman, the League’s first secretary-treasurer—men listened to men. Suffrage husbands were not averse to spending their political capital. In 1913, Laidlaw and the historian Charles Beard, the husband of suffragist and historian Mary Ritter Beard, gave statements at a congressional committee hearing urging the establishment of a women’s suffrage committee. It was the first congressional debate over the enfranchisement of women in 26 years. Beard, like Laidlaw and Eastman and so many others, spoke frequently for the cause. Woman Suffrage Postcard, around 1915. Image courtesy of the National Museum of American History. Big political backers of Woodrow Wilson who were members of the League did not hesitate to demand the president see them on short notice to talk suffrage. J.A.H. Hopkins did this in 1917, appealing for the release of his wife, Alison, who was among 16 protesters arrested and jailed because of Alice Paul’s National Woman’s Party demonstrations outside the White House. That same year, the attorney Dudley Field Malone raced down to Washington, D.C. from New York City to run legal interference for Paul’s picketers—and went even further. Exasperated at Wilson’s continued unwillingness to declare support for the federal suffrage amendment, he resigned the federal patronage post that Wilson had appointed him to, as Collector of the Port of New York. The inspiration for Malone’s headline-grabbing move came not from his wife but from his then-clandestine lover, Doris Stevens, who was one of Paul’s chief lieutenants. The couple married in 1920. League co-founder John Dewey followed the lead of his suffragist wife, Alice, but Rabbi Stephen S. Wise appears to have responded only to the siren call of justice unserved. His wife, Louise Waterman Wise, devoted her time to other causes. George Foster Peabody, the New York League’s first president, did not marry until much later in life. He too took inspiration from his mother. And credit for Eastman’s outsized engagement goes to four women: his mother, the Rev. Annis Ford Eastman; his sister, the attorney Crystal Eastman; his first love, the youthful face of the movement, Inez Milholland; and his first wife, the feminist attorney Ida Rauh. Brooke Kroeger is a journalism professor at New York University. Her latest book is The Suffragents: How Women Used Men to Get the Vote.